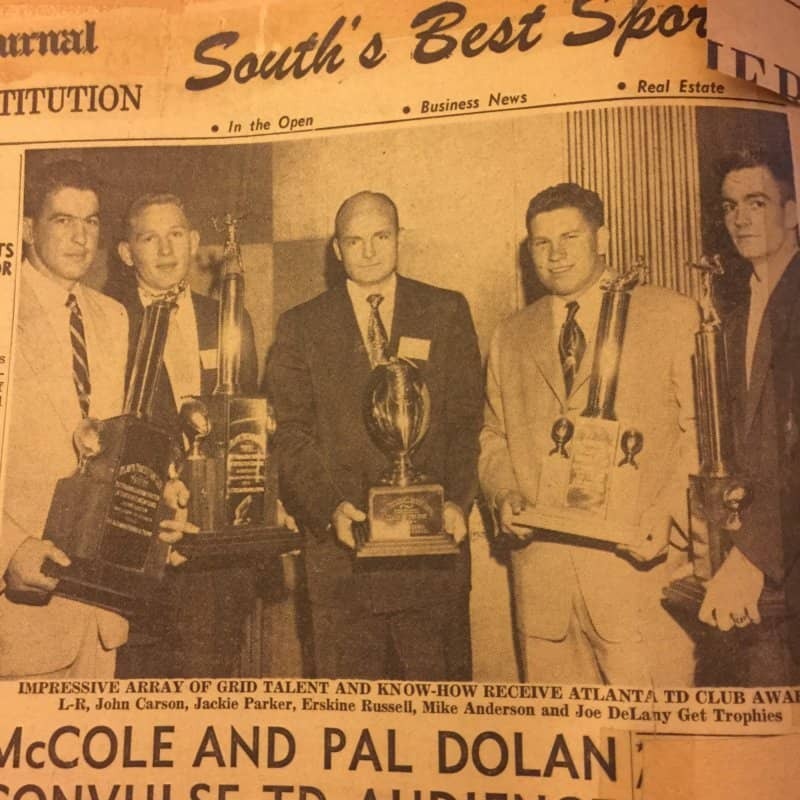 The Touchdown Club of Atlanta is and has a treasure trove of history. Founded in 1938 with the goal of supporting football at the collegiate and high school level, the names of members, honorees, and supporters over the decades is long and distinguished. Each week, we turn the spotlight to one of the many who are a part of our distinguished history. This week we look at the 1953 High School Coach of the Year – Erskine Russell. Coach Russell was in his second season as head ball coach of Atlanta’s own Grady Grey Knights. Coming off of a 6-1-3 campaign in his inaugural year and playing in the very competitive Atlanta City League, the Grey Knights were just one of many contenders in the autumn of 1953. The Atlanta City league – also known then as AA Region 3 North & South, comprised 13 teams in the largest classification in the state. The Atlanta City League match ups and rivalries were the biggest sporting events in Atlanta year after year. It was in this environment that the Atlanta Constitution said that the ‘mild mannered’ coach’s team could be contenders if his team stayed healthy. Although the 1953 team may have been thin in terms of reserve players they did receive the description from the Constitution of a team that “Will run over anything that has the wrong colored football jersey on”. They also had a returning All-state fullback in Wilbur Lofton, who was called ‘one of the hardest running single wing runners in Georgia” and described as “185-pound hell for leather runner probably will be the most devastating ball toter in Atlanta’s City League”. Joining Lofton in the backfield was tailback Jeff Davis, who was also wonderfully fashioned “the lithe speedster” and the “fleetest back in the city league”. This was indeed a talented bunch of Grey Knights. Apart from the classic sports writing of the times, this team displayed traits that young coach Russell instilled; they played inspired, they played tough, and they were disciplined. They would plow through the regular season at 8-1-1 which set them up for the City Championship vs. Region 3-AA south champion, Sylvan High School. In front of 7,500 rain soaked fans, the single winged, no face masked Grady team ran for 371 yards, with Lofton & Davis accounting for all but 59 yards of the total effort on the night. Davis rushed 10 times for 192 yards while the “Bull of the Boulevard” Lofton ran for 120 yards on 14 carries. Grady won the city championship 21-6 and with it, the Region 3 title. The victory earned them the right to travel east and play the Region 4 winner, the Decatur High School Bulldogs for the North Georgia Championship. On another waterlogged field and in front of 8,000 spectators, the Grey Knights broke the Bulldogs hearts with a second half come-from-behind 7-6 victory and hand Decatur their first home field loss in 6 years. This game was dubbed the ‘Miracle of Parkway Drive’ by the great Atlanta Constitution sports writers. The championship game site was predetermined for Macon in 1953 and the opponent just happened to be the hometown Lanier High School Poets (The state once boasted some of the all-time mascot names). In front of a rowdy 10,000 fans the two teams would face off. Lanier was led by all-state back and future Auburn Tiger Billy Kitchens, all-region, all-state and all-south lineman Will Sanders, and future UGA & Philadelphia Eagle legend, Theron “Drought-Breaker” Sapp – one of only 4 Georgia Bulldogs to have their numbers retired. Lanier was loaded with talent and favored to win the championship by two touchdowns. The game was played on December 11th. The headline in the December 12th edition of the Atlanta Constitution would read simply, “Grady Shocks Lanier, 9-6”. In yet another rain soaked and muddy field, Russell’s Grey Knights would not be denied. Called the ‘never-say-die Atlantans’ and led by Wilbur Lofton’s running and most importantly his punting – they pulled off another stunner that left the home team and fans heartbroken. The 1953 squad fought and scrapped their way to Georgia High School immortality. Along the way, The Touchdown Club of Atlanta would name two lineman; Mike Trotter and Walter Stovall as linemen of the week and give coach Russell Coach of the Year honors. 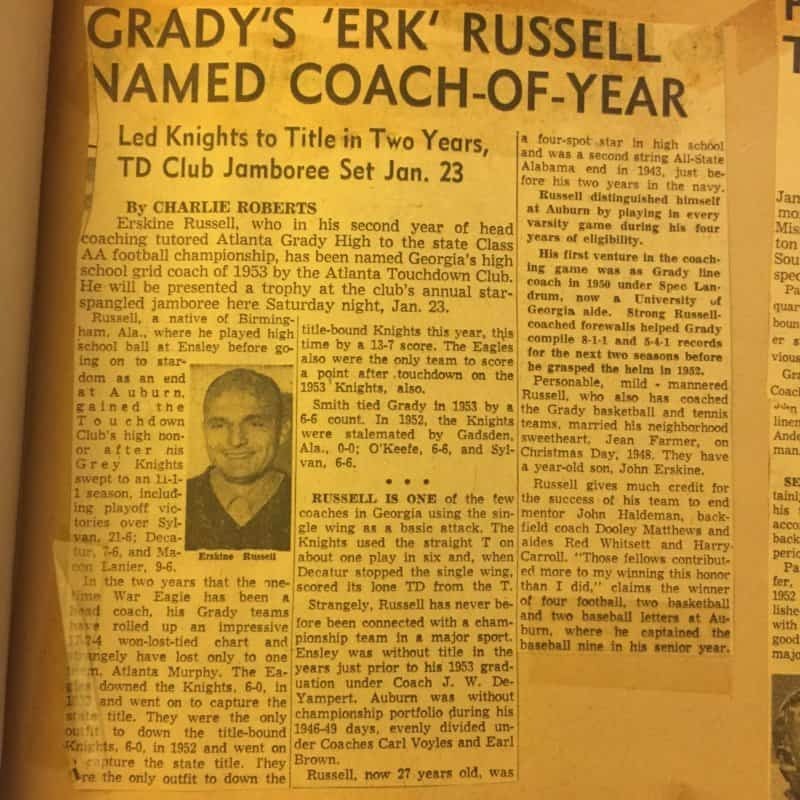 Coach Russell would remain at Grady until 1957 boasting a 71% winning percentage over his six year tenure. In 1958 he would depart for Auburn University and would remain in the college ranks for the remainder of his career. Every legend has a beginning and every tradition is borne from a baptism of fire. The 1953 Grady Grey Knights were BIG TEAM (little) me and they most definitely G.A.T.A. It is time to light a cigar in honor of Coach. 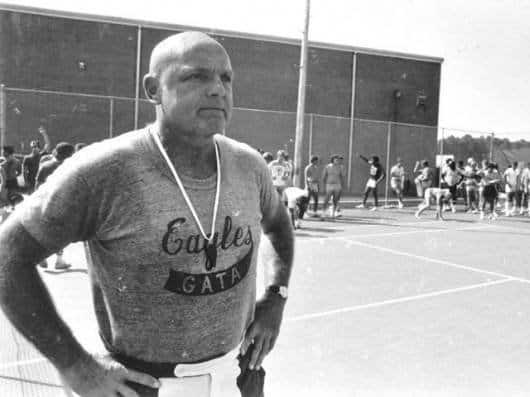 Erk Russell is a coaching legend with very few peers. *As always many thanks the the GHSFHA website and the amazing sports writers from the 1953 Atlanta Constitution – they don’t “lug the leather’ like that anymore.